We’re inspired by an article on Atlas Obscura about preservation issues for Shadows from the Walls of Death, a sample-book of wallpaper with deadly properties, owing to the use of a wildly popular hue in Victorian times: “Scheele’s Green,” or “arsenic green,” as it was also known (which is an indication of one of the necessary ingredients in the color). If you’re so inclined as to wear a bit of green on Saturday, March 17th, please count your lucky clover leaves that your wallpaper, paint, and even clothing are no longer dyed using arsenic green. Here are a few titles–mostly true tales–about toxic topics. Historian Hawksley (Queen Victoria’s Mysterious Daughter) delivers an unnerving account of an unexpected killer in the elaborately decorated homes of Victorian England: arsenic-laced wallpaper. The use of arsenic-based pigments in wallpaper dates to the late 18th century, when a Swedish chemist invented an intense green pigment that was later made more brilliant and durable with arsenic. 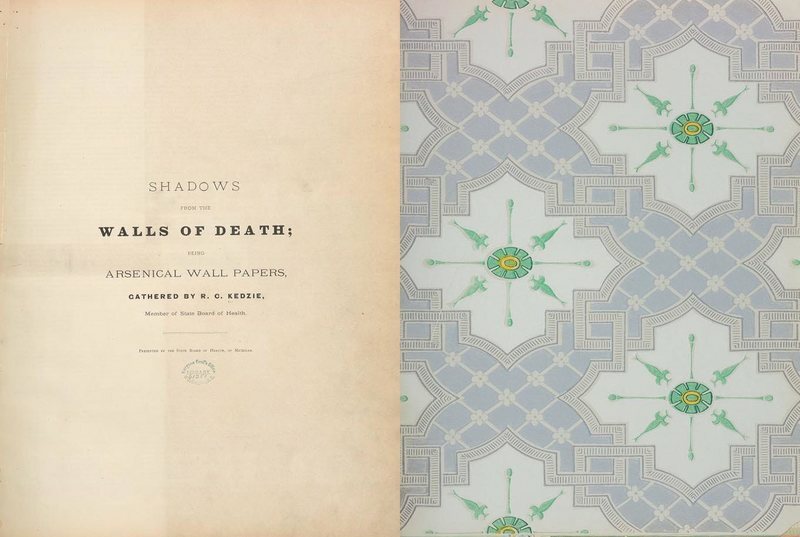 The book’s gorgeous wallpaper facsimiles give no hint of their toxicity; they beautifully evoke Victorian style with their ornate patterns and rich, vivid colors, illustrating why these papers, and specifically their green shades, were so popular. Nineteenth-century urbanization and affluence spurred the demand for wallpaper with deadly consequences for factory workers and homeowners who were becoming poisoned by toxic vapors and dust. Physicians suspected that arsenical wallpapers were poisoning people; however, the highly profitable wallpaper business dismissed the claims and the British government never legislated a ban. In the end, it was the public who pushed for arsenic-free wallpaper. Hawksley notes the prevalence of arsenic in the Victorian home as rodent poison and in dyes, cosmetics, toy paint, and even beer, as well as its legendary use as a murder weapon. The book is lovely, with 275 stunning wallpapers spliced into an intriguing narrative about the lore of arsenic, often called the poison of kings. Fashion historian David (Ryerson Univ., Toronto) examines how clothing caused death, disease, and madness during the 19th and early 20th centuries in France and North America, transmitting contagious diseases, emitting chemical toxins, and catching fire. David’s aim is “to put current problems into a historical context and provide a ‘usable past’ for current debates about health and sustainability in the fashion industry.” The often pointed historical examples include the mercury used to create felted hats that poisoned the hatters who made them; pigments such as green dyes made of arsenic that endangered dressmakers and wearers alike; and combustible fabrics such as crinoline and flannelette. Aside from drawing upon contemporary accounts and archival evidence, the author strengthens her arguments by citing recent and past scientific studies that prove the toxicity of historic textiles. This compelling and sometimes disturbing book is strongest when discussing historical rather than contemporary clothing issues but does make a case for reexamining our fashion consumption in the 21st century and how that consumption hurts the environment and people, especially those in developing countries where most apparel is now produced. Pulitzer Prize-winning science journalist Blum (Ghost Hunters) makes chemistry come alive in her enthralling account of two forensic pioneers in early 20th-century New York. Blum follows the often unglamorous but monumentally important careers of Dr. Charles Norris, Manhattan’s first trained chief medical examiner, and Alexander Gettler, its first toxicologist. Moving chronologically from Norris’s appointment in 1918 through his death in 1936, Blum cleverly divides her narrative by poison, providing not only a puzzling case for each noxious substance but the ingenious methods devised by the medical examiner’s office to detect them. Before the advent of forensic toxicology, which made it possible for the first time to identify poisons in corpses, Gettler learned the telltale signs of everything from cyanide (it leaves a corrosive trail in the digestive system) to the bright pink flush that signals carbon monoxide poisoning. In a particularly illuminating section, Blum examines the dangers of bootleg liquor (commonly known as wood, or methyl, alcohol) produced during Prohibition. With the pacing and rich characterization of a first-rate suspense novelist, Blum makes science accessible and fascinating. This exquisite tale of obsession from Bram Stoker Award–finalist Moore (Redheads) opens with Caleb Maddox, a toxicologist and pain researcher, looking in the mirror of a San Francisco hotel bathroom as he picks tiny shards of glass out of his bleeding forehead. A short time before, his live-in lover, now his ex-girlfriend, threw a tumbler in his face. “It was good glass. Murano crystal, maybe,” from a set they had bought at Macy’s just before she moved in a year earlier. Caleb later leaves the hotel and goes to a bar called the House of Shields, where he meets a mysterious absinthe-drinking woman, Emmeline, who mesmerizes him with a whisper and a titillating silken touch. Caleb’s hard-drinking week-plus pursuit of Emmeline parallels the serial killings that he has been secretly investigating with his oldest and closest friend, medical examiner Henry Newcomb. Male bodies have been washing up in the bay with evidence of unspeakable torture. The scientific lore and postmortem techniques may be more than some readers want to know, but the sympathetic, though brutally flawed hero and the shocking, Hitchcock-esque finale make this psychological thriller a must-read. Colquhoun (Murder in the First-Class Carriage) has once again written a phenomenal and nuanced historical true crime account, this time focusing on the notorious 1889 death of Liverpool cotton merchant James Maybrick and the subsequent trial of his American wife, Florence, for his murder. Maybrick had been in poor health for several weeks at the time of his death; Florence, who was carrying on an affair, stood to lose out if a change to her husband’s will went into effect. She became the natural suspect when evidence emerged that he might have died of poisoning. Colquhoun is evenhanded in her presentation of the arguments for and against Florence’s guilt, and places the mystery in context, demonstrating how many deemed her responsible just because of her marital infidelity. The author’s evocative prose is the icing on the cake: “Under the surface of thrusting progress, beneath the skin of propriety and manners, vicious poverty, a violent gang culture, and physical suffering persisted.” The result is an enthralling page-turner that will attract fans of true crime and Victorian England. British ghostwriter Moore traces the lives of more than a dozen American women who were employed as luminous watch-dial painters as early as 1917. She tells how these women, some barely in their 20s, were enchanted by high pay and the allure of the paint’s luminescent substance: radium. Carefully researched, the work will stun readers with its descriptions of the glittering artisans who, oblivious to health dangers, twirled camel-hair brushes to fine points using their mouths, a technique called lip-pointing. By the end of 1918, one out of six American soldiers owned a luminous watch, but the women had begun losing their teeth and entire pieces of their jaws. Moore describes the gruesome effects of radiation exposure on these women’s bodies, and she spares nothing in relaying the intense emotional suffering of their friends and families during subsequent medical investigations and court battles. In giving voice to so many victims, Moore overburdens the storyline, which culminates with a 1938 headline trial during which a former employee of the Radium Dial Company collapsed on the stand and had to testify from bed. Moore details what was a “ground-breaking, law-changing, and life-saving accomplishment” for worker’s rights; it lends an emotionally charged ending to a long, sad book. They may look sweet and innocent, but anyone who has ever broken out in a rash after picking a hyacinth blossom or burst into violent sneezing after sniffing a chrysanthemum knows that often the most beautiful flowers can pack the nastiest punch. This comes as no secret to mystery writers, who have long taken advantage of the nefarious properties of common garden plants to create the devices by which a deadly dose of poison is administered to an unsuspecting victim. But, as Stewart so entertainingly points out, such fiction is based on pure fact. There are plants that can kill with a drop of nectar, paralyze with the brush of a petal. From bucolic woodland streams choked by invasive purple loosestrife to languid southern fields overrun by kudzu, some plants are just more trouble than they’re worth. Culling legend and citing science, Stewart’s fact-filled, A–Z compendium of nature’s worst offenders offers practical and tantalizing composite views of toxic, irritating, prickly, and all-around ill-mannered plants. Fans of Erik Larson’s true-crime thrillers will be pleased by this gripping account that presents a tipping point in the public acceptance of the telegraph: its use in 1845 to alert the authorities in London that a murder suspect had boarded a train headed there. With a novelist’s flair for drama, using details that were painstakingly extracted from the historical record, Australian popular historian Baxter (An Irresistible Temptation) recreates the life of suspect John Tawell, a Quaker who had been transported for forgery, the events leading up to his apprehension on suspicion of having poisoned Sarah Hart, and his prosecution. Along the way, the story takes several unexpected twists, and Baxter does a stellar job of integrating details about the nascent forensic science of the time, questions about the role of expert witnesses in jury trials, and the insatiable public hunger for salacious details about the case.